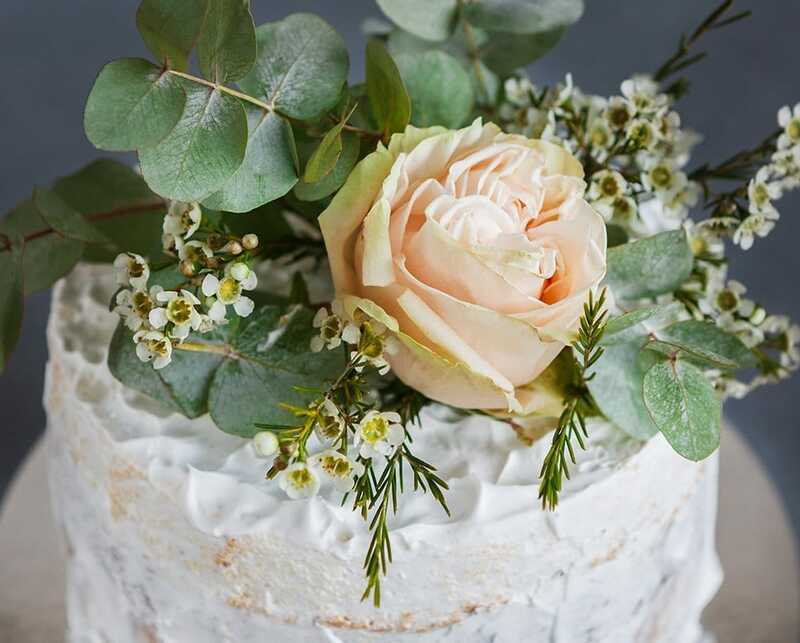 Putting fresh flowers on a cake is a great way to add some gorgeous decoration to your wedding cake but it’s important to make sure your flowers are prepared properly. Placing fresh flowers into a cake without sealing them can cause toxic chemicals (like pesticides) to leach into the cake and potentially cause a major food hazard to your guests. 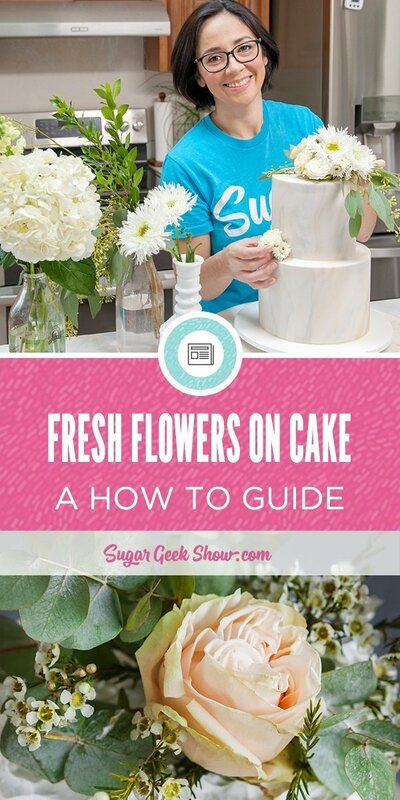 Follow this simple guide on how to put fresh flowers on cake without making anyone sick. 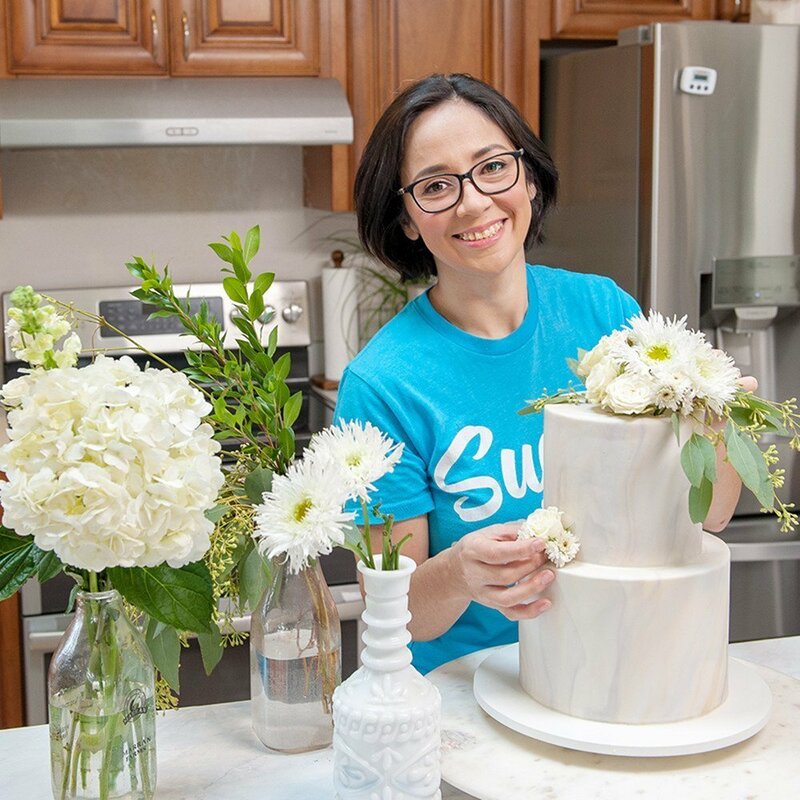 And if you’re interested in making the gorgeous marble wedding cake, be sure to check out the other tutorials in this series. Why do you need to make flowers food safe? Aside from leaching toxic chemicals into your cake, some flowers are actually poisonous to humans if eaten. Some of these flowers can cause an upset stomach but some are deadly poisonous. 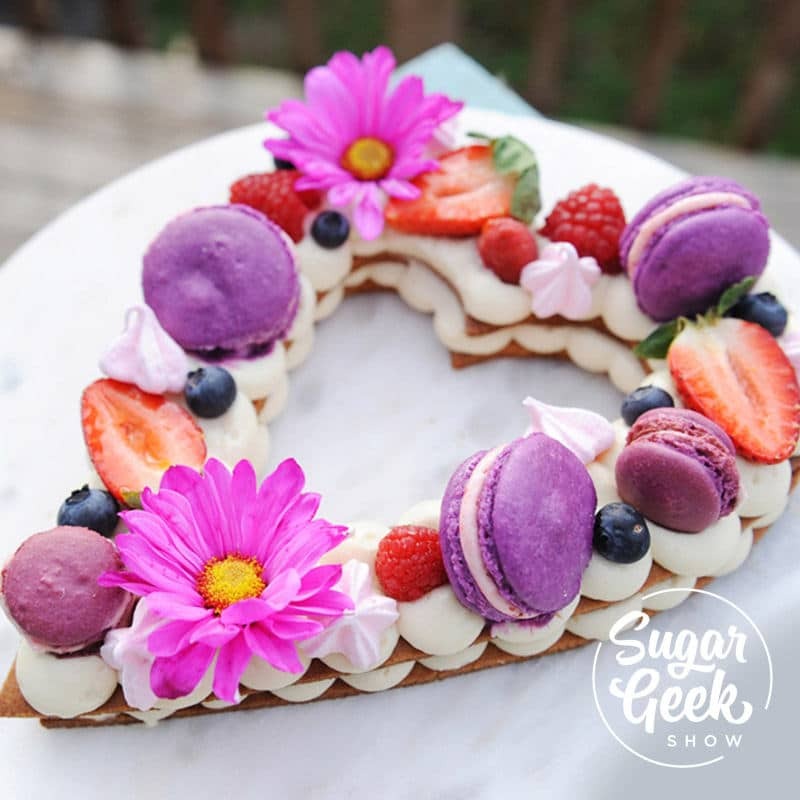 That doesn’t mean you CAN’T use all these flowers on your cake but you should take extra precaution to make sure they are sealed, safe and clean before placing on the cake. Here is a list of poisonous flowers, some might surprise you. I talked to my florist friend Kim who is the owner of Swoon Floral Design here in Portland and she says she get’s her flowers at the flower market but you can get your flowers from a grocery store or whatever is most convenient to you. Make sure you buy more flowers than you think you need because some of the flowers might wilt and not look very nice when it’s time to use them. Choose some flowers that are large as the main attraction and then some smaller flowers and leaves to use as fillers. If you are only using large flowers it will be harder to fill in holes in certain areas. Usually flowers come with a packet of flower vitamins that you mix in with the water to help keep them fresh. Follow the instructions on how to mix this and then keep your flowers in water until you use them to avoid wilting. Step 3 – Who puts the fresh flowers on cake? Once upon a time, I delivered a rustic buttercream cake to a wedding and placed it on the cake table. The florist arrived as I was setting up and proceeded to shove fresh roses into the cake without even asking me. Even in the early days… I was pretty sure this wasn’t ok. After that day I always let the florist, bride, coordinator, everyone know ahead of time that I would place the flowers myself. A copy of the cake sketch would be forwarded to the florist as well. I would instruct the bride to let the florist know to leave whatever flowers she had for me for the cake in a bucket of water by the cake table. If there wasn’t a florist, I would let the bride know that I did not buy flowers and if she wanted flowers someone would have to buy them and place them at the table. You’ll need floral tape, scissors and plastic wrap. In the past I have used straws or water picks and those work pretty good too but sometimes my stems are too thick for the straws. Making your fresh flowers food safe is pretty simple although it can be time consuming depending on how many flowers you need to put on the cake. I would typically allow myself an extra hour at set-up to place flowers. Cut your main large flower and a few smaller flowers to accent it. Trim some plastic wrap to about a 3″x3″ square. What are some other ways to make flowers food safe? I have also used chocolate as a seal on the back of some gerbera daisies that I used to decorate my cream tart cake. Ok so now that you’re probably scared to even put one flower on a cake, let me put your mind at ease. Toxicity levels will vary based on the level of contact with the flowers. For example, ingesting even a small part of some flowers can cause symptoms, whereas for others you’d need to ingest a large amount to see any effect. With any exposure or symptoms, it’s advised that you contact the Poison Control Center (800-222-1222) or your doctor immediately. Stick to eating the cake and you should be ok. There are also quite a few flowers that are completely safe and can even be eaten. These edible flowers do not need to be sealed and can be placed directly on the cake IF they haven’t been treated with any pesticides. Even edible flowers should not be eaten if they aren’t organically grown. Is it okay for the leaves to touch the cake? You only talk about safety for the stems. This is great information and thanks! In addition to your tips I’ve got one. I always glaze the back of fresh flowers so little bugs don’t survive and you also seal the flowers and leaves and not only the stems. What do you glaze them with? Thanks so much for this awesome tutorial! When putting fresh flowers on the cake, how long in advance would you prep the flowers? Would you wait until having the cake in the venue to do it? Or would you have them prepped before and just insert them on the cake upon delivery?